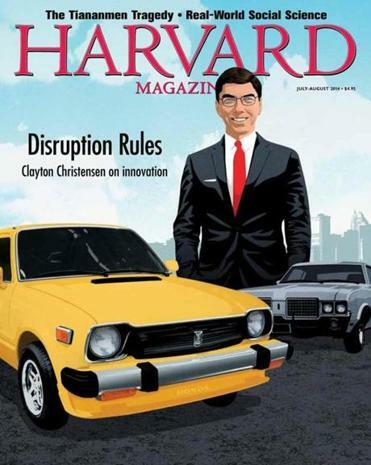 The summer issue of Harvard Magazine hailed Clay Christensen as a “disruptive genius” — a case of unintentionally amusing timing. Who says nothing ever happens on a college campus during summer break? Fireworks — the academic kind — went off at Harvard University a couple of weeks ago, and the boom has been reverberating ever since. Hard words and harder feelings were only part of the fallout. It started with a long article that Harvard history professor Jill Lepore wrote in The New Yorker about Clay Christensen, one of the world’s best-known business professors, who happens to work on the other side of the Charles, and his famous theory about disruptive innovation. The CliffsNotes version of her 6,000-word piece: The theory is full of holes, and the revered Harvard business professor isn’t much of a scholar. Disruptive innovation is really useless as a tool to anticipate the future, she says. Many people have since described Lepore’s article as a take-down and even an evisceration. Is there such a thing as attempted academic assassination? All of this transcends normal ivory tower obscurity because Christensen’s thinking about disruptive innovation is so widely embraced all over the world. It is a lens through which countless businesses view rapidly changing technology that could turn established industries upside down. They use it to help plot strategies to survive and, hopefully, thrive in the process. In a case of unintentionally amusing timing, Harvard Magazine put Christensen on the summer’s issue’s cover. Inside, he is hailed as a “disruptive genius” spreading his gospel. It is no exaggeration to call Christensen’s theory one of the two most valuable pieces of intellectual property developed at Harvard’s business school, which is home to a lot of expensive ideas and a culture inclined to keep track down to the dollar. (I count Michael Porter’s ideas on competitive strategy as the school’s other hugely valuable business concept). I don’t think many people at the Business School were ready for the rocket launched from the history department in Harvard Yard. It certainly came as news to Christensen. In her article, Lepore criticizes disruption advocates for their “affinity for circular arguments.” She thinks Christensen cherry-picks case studies to prop up his theory. She says his “sources are often dubious and his logic questionable.” Lepore declined to talk about the article with me Monday. Christensen has his own unflattering words for Lepore. He said she treats disruptive innovation as an idea published long ago, in his book called “The Innovator’s Dilemma,” rather than a theory that has evolved and been refined for 17 years. He argued that her background in microhistory — deep dives into specific events — makes her ill-equipped to analyze theories like his. “It’s like trying to measure a distance with a stone,” he said. The basic ideas behind Christensen’s principle are remarkably simple and straightforward. They describe how established companies can be threatened by innovative new products that are cheaper but inferior at first. Digital Equipment Corp. and the personal computer revolution is perhaps his best-known local example. Today, thousands of companies face such threats. That includes every newspaper in America, so I know the experience feels a lot like tumbling inside a clothes dryer. It usually involves some unpleasant choices. Talk about disruptive innovation long ago jumped beyond business case studies into other fields, like the future of higher education. Strike up that conversation and you may see real fireworks on campus.